Hello <<First Name>> and welcome to my email list, glad to have you onboard! You're currently taking part in a series called Mastering the Fundamentals of Classical Guitar Playing. Emails are sent every Wednesday and Sunday. If you've just subscribed, you can catch up on older material here. One subscriber asked the question of how to avoid boredom during practice. This seems to be a pretty hot topic amongst players, and is something that I constantly battled myself for years. I remember the days when I used to practice scales in front of the TV, because I found them that boring! I eventually found ways to trick my brain into being alert, aware, and engaged, no matter what the material is that I'm working on. For example, now I love practicing open strings, and can sometimes practice them for a whole 15 minutes straight (no TV involved!). Outlining and summarising many of the topics already covered in this series can be a great place to start finding ways of tricking your brain out of boredom land. Why do I use the word trick? This word has two meanings that I like. One is "a clever or particular way of doing something", and the other is "a peculiar or characteristic habit or mannerism." I'll now break this down into two things; mindset, and tools. I think the way that we've generally been taught (in school, college, and culture in general) is to just seek the "correct" answer so that we can pass a test, exam, or something similar. This sort of mindset can translate into practicing an instrument, whereby our aim is merely to find one "correct" way of doing something (whatever that might mean?!). What if instead you asked yourself during practice "what are all the possibilities available to me at this moment?". Instead of finding one correct way of playing something, you discovered multiple - you created new possibilities that you might not have ever imagined of before. Try it next time your practice - why not even apply this mindset to other areas of your life too! Find three, four, five, maybe ten different ways of playing one passage of music. Taste test and see which ones you like the best. I love cooking, and I have to say if there was no taste testing involved, then the food would probably not turn out very edible! Don't forget this, because setting that timer can trick your brain into becoming super focused and not wasting time! II. Orchestrate the parts: Separate the voices as if each one were your part in an ensemble, then put them back together. III. Separate the hands: Practice left hand only. Practice right hand only. Simple! IV. Harmony: Reduce the passage to its most fundamental harmonic progression (knowing the triads found in Fundamental Harmony can help). Play your passage or piece as a simple chord progression, like a singer-songwriter! V. Rhythm: I haven't talked about this yet, but I'll keep it brief. Isolate the rhythm and practice it, even if the rhythm is very simple. You can simply clap the rhythm, or play it on an open string, or conduct and speak the rhythms (remember ta & ti ti?). Do this with and without the metronome. Dividing and conquering helps trick your brain because you are essentially simplifying things and practicing small bits in different, varying ways. This means that you can make something better much faster than if you were working on a piece of music as a whole. You can also rapidly practice different skills in a short amount of time. For example, spend 5 minutes just on orchestrating the parts, then spend 5 minutes on separating the hands, etc. etc. This constant shifting of focus is one of the keys to avoiding boredom, and inviting creativity. This is really one of the most valuable things you can do when practicing. It instantly reveals what you actually sound like, not how you think you sound. It forces you to stop and reevaluate what you're doing. It forces you to stop and actually listen to your playing, and if you're bored then it will come across in your playing! A word that from the 20th century until recently has been treated with undue contempt in the classical music world. Before the 20th century, improvisation was a very normal and basic part of a classical musician's practice and training. The Rule of the Octave (the harmonised scale found in Fundamental Harmony) is just one tool that you can use for improvising with. If that doesn't float your boat, then you can use your pieces as models for improvising. It can be as simple as adding small and subtle ornaments, or as complex as adding ornate variations. If the piece is in major, try playing it in minor and vice versa. If the piece is fast, play it slow and vice versa. If you find a chord shape that you like, shift that chord (hand shape) up and down the fretboard. Put a capo on the first or second fret and play, experiencing the change in resonance and mood created. Divide your passage/piece up into two, three, or more parts. Find two, three, or more people to jam with using those parts as material. All of the above can help you memorize a piece, however simply having it as your end goal can sometimes stimulate you enough to swat away any of those boring bugs that might come your way! If something is new, never try and memorize it as a whole. Break it down into bite sized pieces that allow you to memorize easily and effectively. Think of it as a challenge, with the reward simply being that you can now play something without the aid of the score - it's now part of your memory! I hope that you find your own ways and habits for keeping boredom out of your practice. I'd love to hear of any habits or methods you know of already, or any that you might discover. The next email will discuss one of my favourite methods for memorizing, and is a great mental workout (much better than those brain training apps!) - writing out your piece on manuscript paper, away from the instrument. You are free to copy this to others unchanged, but please reference Daniel Nistico as the author. 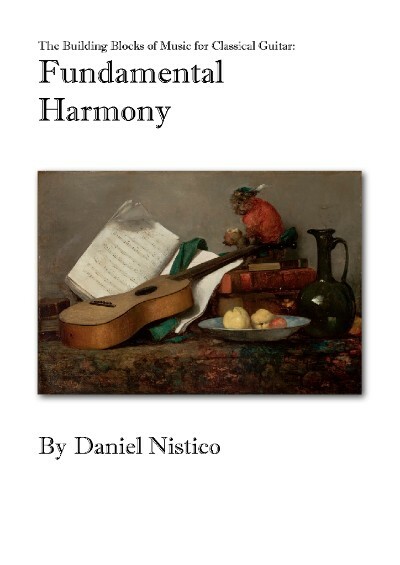 If you want to purchase Fundamental Harmony in full, please click on the image. I would love to know if/how any of the material has helped you in your playing and practice, so please email me - I read every email!